With huge thanks to Kieran Vanden Bosch of The Invention Shed, Somerset. … Later back at the garden as the wind came howling into our shelter I tried to describe what I’d seen. I faced disbelief and incomprehension but some made sense of what I’d said and with the wind as a motivating factor and we began collecting. Asking at restaurants and cafes and digging around in recycling boxes like urban foxes. They had to be all exactly the same size so we quickly became connoisseurs of tetra pak subtleties. Next came the washing… it turns out when soya milk goes bad it really goes bad! 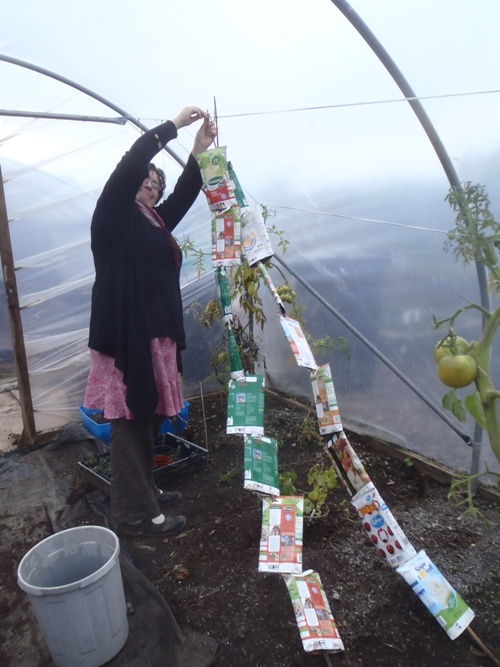 Then the drying, see below for Nikki’s ingenious tetra pak drying rack. And then the stapling could begin. So. Much. Stapling. The paks were stapled to wooden runners which had been painted with gloss to last longer. 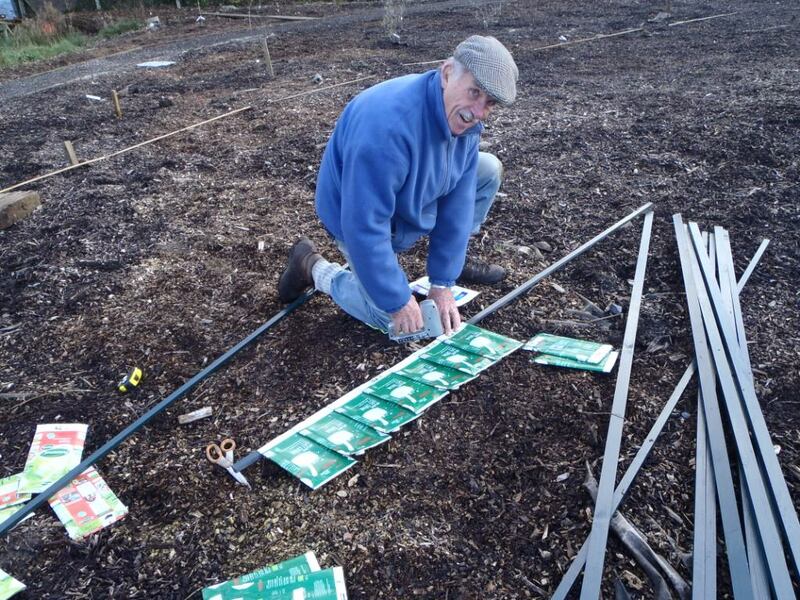 While the volunteers stapled and stapled, Pete scratched his chin and worked out how we could fit it all together. The runners are screwed onto a wooden frame and then attached it with hooks on the shelter. And then one happy day it was done. 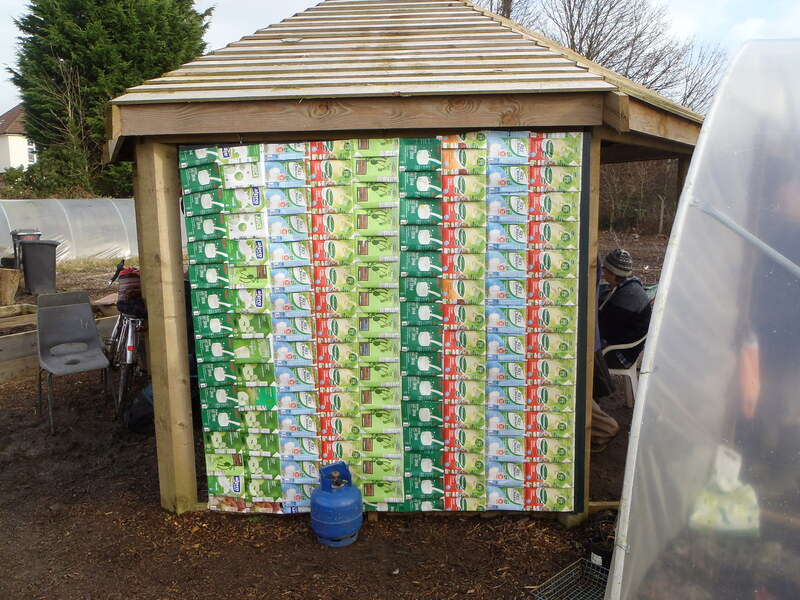 The idea is we can move it to let the sun light in or shift it round to other side of the shelter for when our usual prevailing wind shifts to an icy northern blast. We are very proud of our windscreen, it gets a lot of attention from everyone and has been a welcome splash of colour in what has been a bit of a grim winter.